Counting songs like Five Little Ducks, Five Little Monkeys Jumping on the Bed and Five Green and Speckled Frogs teach a great number of important skills. These songs teach counting backwards, counting in sequence, counting with fingers, gestures, rhythm, beat and rhyme. Number songs are a great way to incorporate many different learning experiences. Get a copy of our nursery rhyme pack today to sing some counting songs with your child. Finger plays with movement are great for fine motor practice. Songs like The Itsy Bitsy Spider are a wonderful way to incorporate fine and gross motor skills. Use your fingers to create the spider climbing the spout, the rain, and the sun. These hand and finger movements are a great way to encourage your child’s fine motor skills, which are important for writing. Make singing part of your everyday routine. 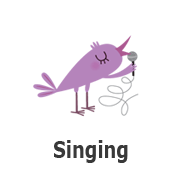 Sing a song at clean up time, bedtime or dinnertime. Singing is a fun way to get everyone excited about an event and also helps calm a child during transition time.